If the earth’s ecosystems were without boundary, then indeed there would be no need to internalize the externality and these free, common resources could continue to be used without concern. But unfortunately the earth’s ecosystems are finite and the boundaries are today being discovered with profound consequences of inaction (See, for instance, “Are the Oceans Dying?“). So why are the commons such an issue today more than in decades past? The core reason is that more than any point in the past history of human evolution, our economic activity today, due to the post-industrial expansion of human capacities, is exerting a much greater force on the planet. There are two dimensions to this increasing force. First, there is the population dynamic – the very fact that the global population has increased sevenfold from a billion people in the 19th century before the industrial revolution to today, in which we recently reached 7 billion, means by itself that something decisively different is in the works in terms of how we interact with the environment. Second, the gains in human productivity presents an even greater challenge in the coming decades than population. The force exerted on earth by increasing per capita economic prosperity and thus increasing per capita resource use, exploitation, and depletion. 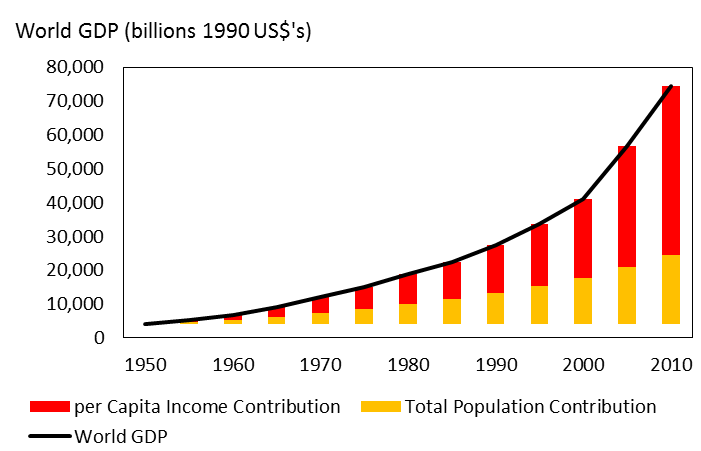 When one combines the population and per capita income elements, the result is the full picture of how much greater our demands on the planet have become compared to the past (Figure 1). This accelerating curve of global economic activity has done wonderful things for man in technology, health, poverty, etc., but it has also placed the earth’s natural resources and commons at tremendous risk if left out of the market equation. And the observable effects on the commons have been severe. Human activity has played a role in the depletion of most every exploitable resource niche in the natural world. Nobel laureate chemist Paul Crutzen named the post-industrial world to be a new geological era: the Anthropocene; the new world dominated by human activity (See Paul Crutzen’s article; “Can We Survive the ‘Anthropocene’ Period?“). Stanford ecologist Peter Vitousek and his colleagues conducted a ground-breaking study in 1997 that showed the extent to which human activity today dominates the earth’s natural systems across a variety of domains. Amongst the factors they tallied, Vitousek estimated 50% of the Earth’s land photosynthetic potential, 60% of river runoff and over 2/3rds of marine fisheries have been appropriated for or depleted by human use (Vitousek et al, 1997). In the skies, we have increased global warming CO2 concentrations by 40% relative to pre-industrial times (See, for example, Jim Hansen’s “Storms of My Grandchildren“). On the subject of biodiversity loss, the World Wildlife Fund keeps an annual “Living Planet” index (shown in Figure 2) that estimates the populations of wildlife species: terrestrial, marine and freshwater, relative to 1970 levels. In Figure 2, the black line represents the overall index which has declined 27.5% since 1970 (to 2005). 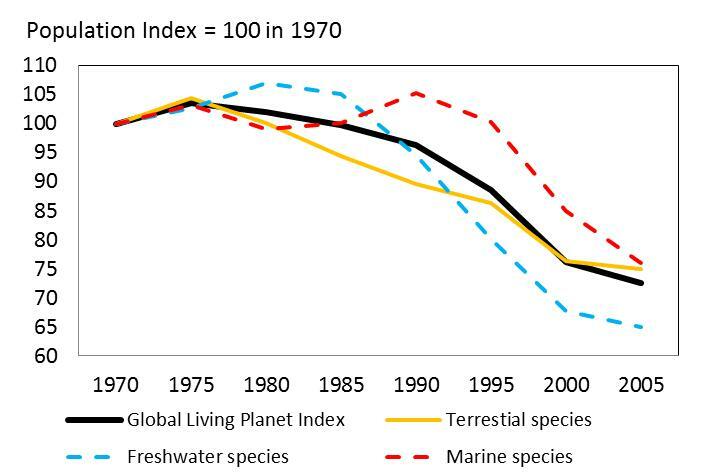 The two dashed lines represent the sub-indices for marine and freshwater species that have shown even steeper rates of decline than the overall index in recent decades. The index currently incorporates data on the abundance of 1,477 vertebrate species around the world, of which 813 are terrestrial, 344 are freshwater and 320 are marine. The population data is indexed such that 1970 = 100. To address the exploitation of the commons, we must begin by acknowledging that human civilization is highly dependent on the health of the world’s ecosystems and that these ecosystems are in trouble. To stop the decline and one day bring about a sustainable balance between economics and nature, there needs to be a price put on the international commons – a price on pollution, a price on carbon emissions, a price on taking from waterways, a price on depleting biodiversity, a price on fish catch, a price on deforestation, a price on leaving a depleted planet for future generations. Whilst the commons will always be used and enjoyed by all, taking from the planet at rates above the natural rate of replacement must be dis-incentivized by financial or legal constraints that recognize the intrinsic value (both economic and intangible) of these natural wonders. Only this way can there be progress towards a sustainable solution. The way that a price on the commons is introduced can take several forms: 1) policymakers could directly regulate the use of the commons (such that power plants can only emit so much CO2 into the skies per year and fishermen can only catch so many fish out of the seas), with financial and legal penalties for non-compliance, 2) policymakers could assign a price by taxing the use/abuse of the commons (carbon tax and tax on the size of the fish catch) or 3) we could allocate private property rights over the commons via a market mechanism (cap-and-trade on carbon and similar cap-and-trade on global fisheries). Whatever method is chosen, the agreement must be international and it must be binding. In “Collapse”, Jared Diamond wrote that “human societies and smaller groups may make disastrous decisions for a whole sequence of reasons: failure to anticipate a problem, failure to perceive it once it has arisen, failure to attempt to solve it after it has been perceived, and failure to succeed in attempts to solve it”. Today, with the scientific evidence before us speaking in near consensus to the crisis of the commons, the next hurdle we must overcome is in how we choose to respond to these forewarnings – and prove whether we as society have the foresight, decency and moral courage to build today towards a better tomorrow.